Paella is a rice dish which comes from the Valencian region of Spain, it is also considered as national dish of Spain. 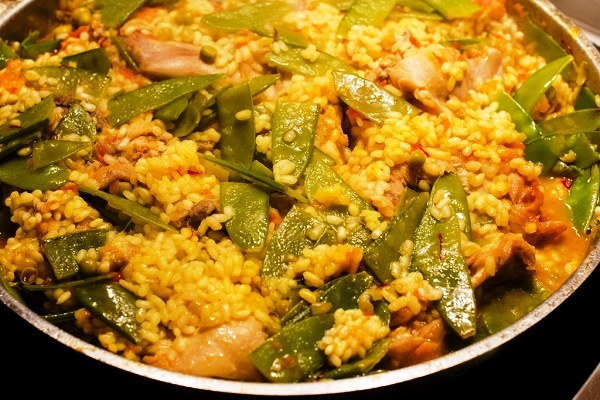 There are various types of paella available around the world but the Valencian paella, which is made with rabbit, snail and beans is considered to be oldest and authentic among all, in fact it has become an identity of Valencia. The word paella basically means “pan” which originated from the Latin word “patella”, Patella is similar to the Hindi word “Pattila” which is a wide shallow vessel used in Indian cooking. 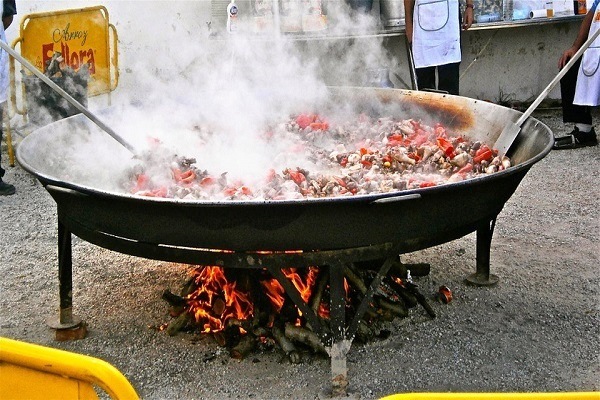 In Spain “Paellera” is traditionally used in making of paella, it is a round, shallow pan made of steel with two handles. There are many stories behind the origin of paella, but the most talked story is of the workers in the field at Albufera (Fresh water lagoon near Valencia city), It is said that this dish came into existence when the workers during lunch prepared their rice in a flat pan over fire by mixing whatever they had at hand at that time, initially it was snail, fish, Water Wole, and beans later they added rabbit, chicken and other vegetables to the dish. There is also other story which says that paella came into existence when the servants of the Moorish King made a rice dish by mixing the leftover food from the banquet. 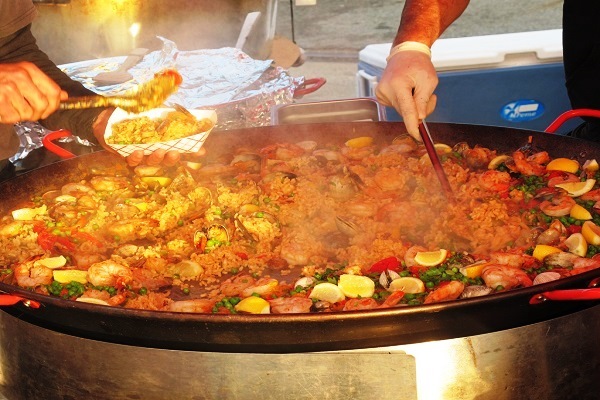 Some also believe that the word paella originated from the Arab word “Baqiyah” which means “leftover”. Due to the popularity of paella, eventually it crossed the Spanish border and was included in other countries cuisine’s, that had its cultural and environmental influence on this dish which can be clearly seen by the presence of the regional ingredients in the recipe. Thus paella from being a simple food became a must try delicacy. Believed to be originated from the “Moorish Spain” region (today’s Spain and Portugal), this region was known to be rice producing area hence the staple diet of Moorish people became rice which led to existence of many rice dish such as paella. Traditionally Arabian paella was made with vegetables, cod and spices. 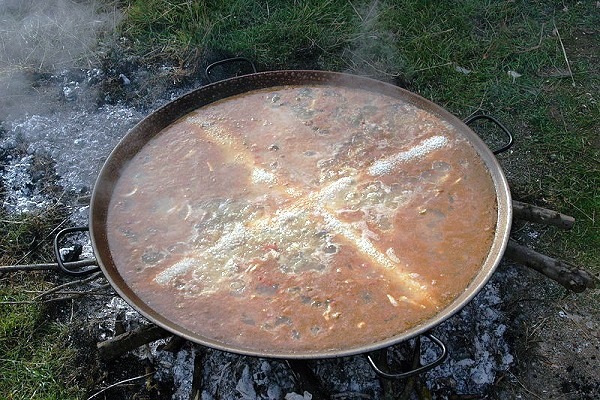 This the most authentic of all paellas, originated in 18th century at Albufera near city of Valencia. This was the paella which gave its current name for the first time. Common ingredients used in Valencian paella is, Chicken, Rabbit, Duck, Eel fish, Snail, beans and spices. 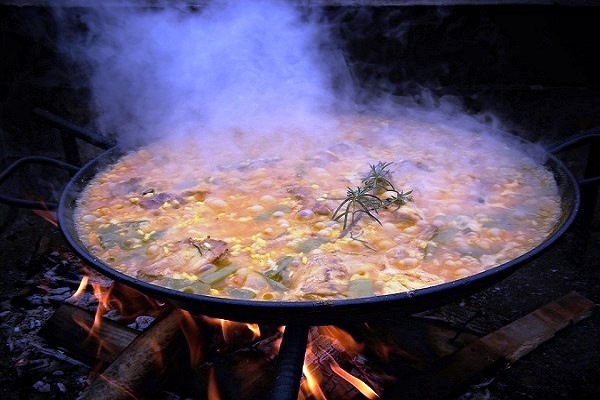 Most famous of all paella found across the globe, even this is regarded as authentic paella by the Valencians. Originated on the Mediterranean coast, as the availability of sea food was more compare to meat. In the authentic recipe the sea food is served in the shell. There is a variant of the paella known as “Paella del Senyoret” in this the seafood is served without the shell. Also called as “Preparación Barroca” in Spanish. When paella became popular, people stated experimenting with the recipe, mainly because of the availability of the ingredients and personal liking, this is when mixed paella was born. In the Non- Valencian region of Spain and other part of the world this is the most popular paella, which by the way if you serve to any Valencian by saying it’s an authentic paella, might get you in trouble and you may have to eat alone. In this recipe seafood is combined with the meat and vegetables along with the spices and rice. 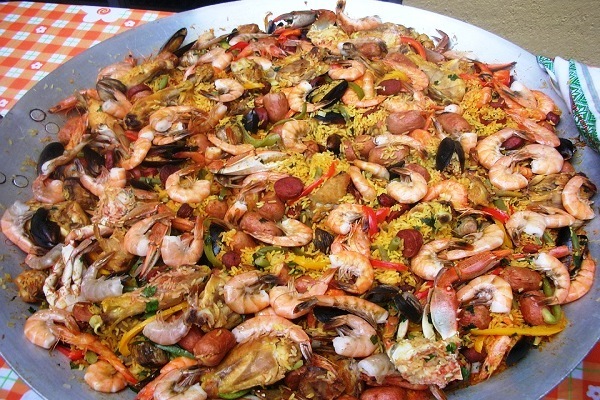 In modern day paella variety seafood, meat, vegetables and spices are used, some recipe even include sausages in it. The most common of all the ingredients in any type of paella is rice, without this you cannot call your preparation as paella. There are basically two characteristics that is seen before selecting rice for paella i.e. 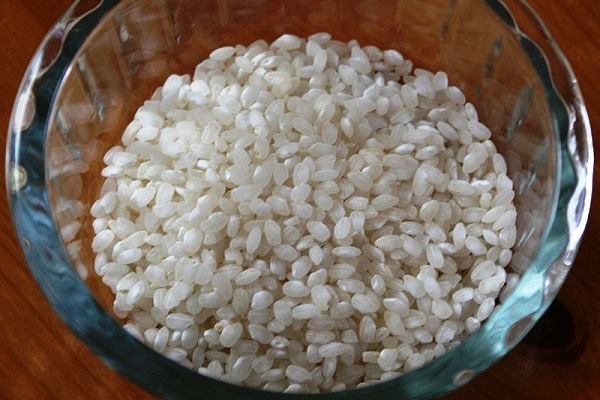 first is the ability to absorb water and the second should not burst open during cooking, medium sized (5-6 mm) rice are the most preferred in paella preparation. If the rice is over cooked, it loses the ability to retain flavor hence it is very important that proper rice is selected. The most common rice used in paella making are Bomba and Balilla rice from Calasparra (Murcia) region of Spain, Bay and Senia from Valencia also called as Valencia rice. The quality of these rice is that it requires large amounts of water and a longer cooking time, so the grain swells more and absorbs more flavors also it is not easily broken during the cooking process. Another constant in paella making is sofrito, it is a sauce used as base in many Spainish and Portuguese cooking. Sofrito is an aromatic sauce made from chopped vegetables made by sautéing or braising in oil. Typically garlic, paprika, tomatoes, onions, olive oil, sometimes bay leaves, and Spanish red peppers called “Noras” is used in sofrito preparation. The flavor and the color of the sofrito depends upon the cooking time of it, the longer the cooking time, the darker and robust will be the color and flavor. This is known as “Refogado” or “Estrugido” in Portuguese-speaking nations. 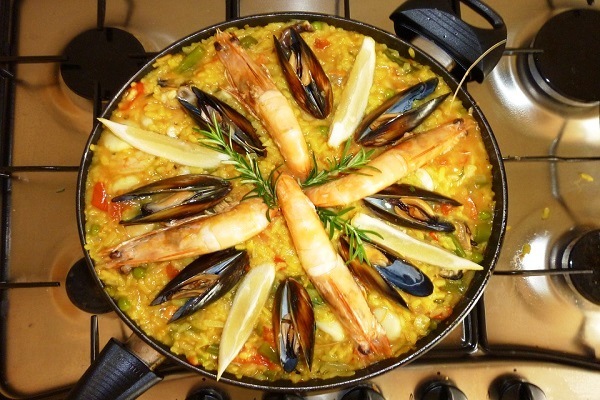 Selection of meat, vegetable and seafood in paella depends upon the geographical and regional availability, but there are certain ingredients that cannot be omitted from the recipe if you want to call your dish as paella. In authentic Valencian paella the ingredients used are Chicken, Rabbit, Wild Duck, local Snail called “Vaquets” and “Xoneta”, Beans such as butter beans, runner beans, string beans called “Ferraura”, beans with resemblance of lima beans called as “Garrofo”, white color beans called as “Tavella” and there are other vegetables such as artichoke and tomatoes also used in making of this paella. The Moors used similar recipe with omission of the meat but there were fish such as used in the recipe along with beans and other vegetables like eggplant. In modern day paella ingredients such as sausage (chorizo), squid (calamari), crab, peppers, cuttlefish, white fish, baby corn etc. is used. Like in any recipe here also herbs and spices bring the added aroma and flavor to the dish, common spices used in paella are saffron, pepper, salt, rosemary, thyme, chives, garlic, cilantro, olive oil, paprika, bay leaves, onion, etc. Large pan called as Paellera is used in making of paella, this pan is usually made of steel, iron or cast iron with two handles. The paellera is unique when compared to other rice preparing vessels as this is wide in area and less shallow in depth, this ration is suitable for evaporation which is an important factor in paella making, it is believed that the paellera should be more in diameter and less in depth for perfection of paella. The depth is usually 5-10 cm. and the diameter is in between 10 to 100 cm depending upon the no of dinners. Should be washed with vinegar before used so that there is no metallic taste also paellera made of cast iron is appreciated. The best way to cook paellera is to cook over an open fire of wood or charcoal, authentically it is fueled by orange and pine branches along with pine cones. This produces an aromatic smoke which infuses the paella, which can be felt in the taste. 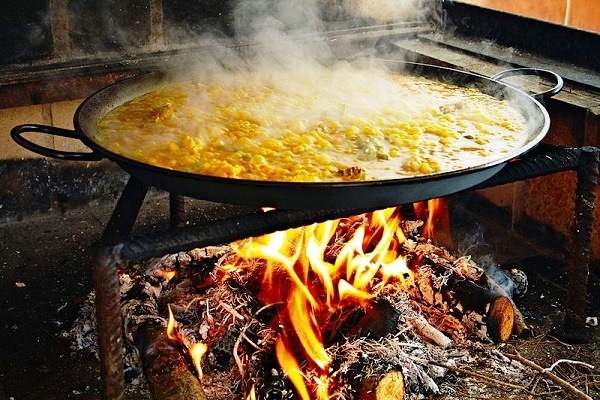 The oldest and most common way to cook paella is to place the paellera on a triangular iron contraption with three legs, called “trivet”, the trivet is then placed directly over the firewood. 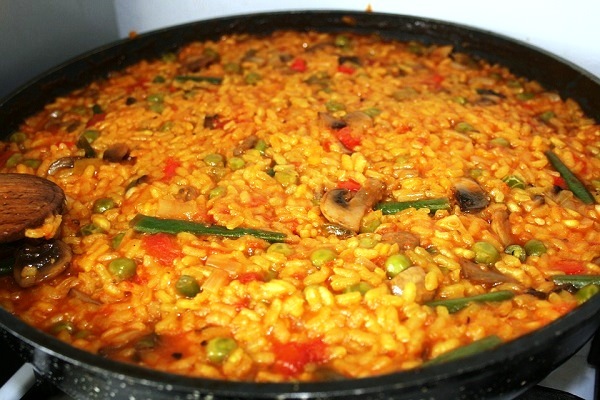 After cooking paella, there is usually a layer of toasted rice at the bottom of the pan, called “socarrat” in Spain. This is considered a delicacy among Spaniards and is essential to a good paella. 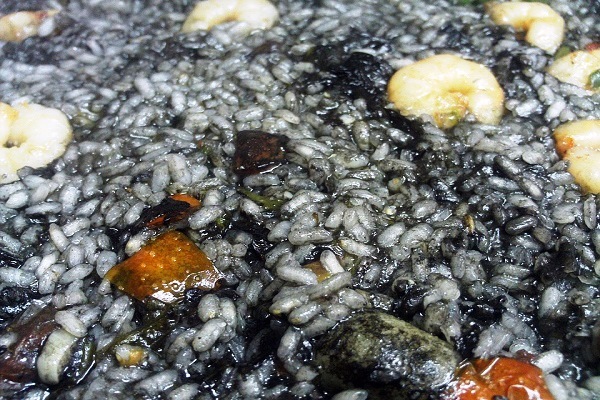 The toasted rice develops on its own if the paella is cooked over a burner or open fire. If cooked in an oven, however, it will not. 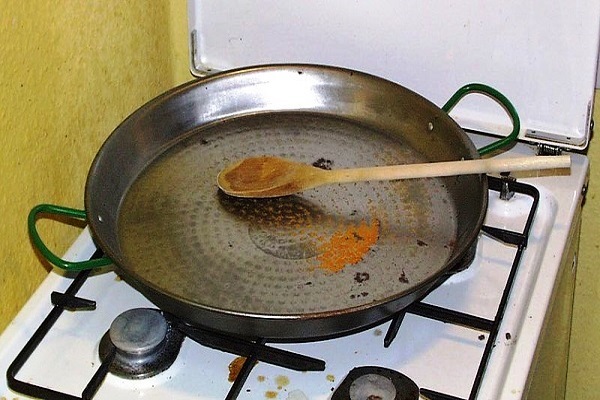 To correct this, place the paellera over a high flame while listening to the rice toast at the bottom of the pan. Once the aroma of toasted rice wafts upwards, it is removed from the heat. The paella must then sit for about five minutes (most recipes recommend the paella be covered with a tea-towel at this point) to absorb the remaining broth. The classical way of paella service is that each diner is provide with wooden spoon and plate so that they can to take it directly from the palleras, also wooden spoon avoids any metallic taste to the paella. Usually paella is paired with young red wine or light pink wine, or with Sangria and Aioli. Classical garnish for paella is Lemon wedges on the side and chopped chives. Valencian restaurateur Juan Galbis claims to have made the world’s largest paella with help from a team of workers on 2 October 2001. 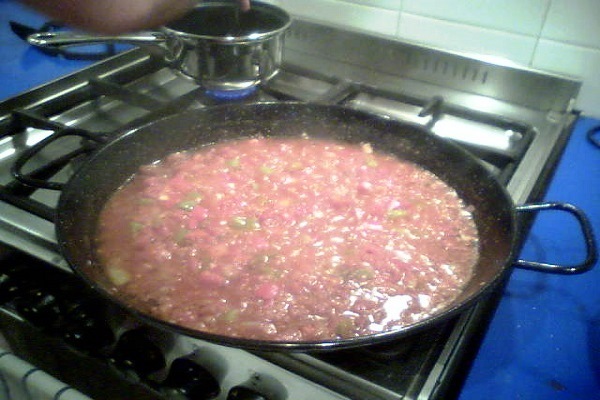 This paella fed about 110,000 people according to Galbis’ former website. Galbis says this paella was even larger than his earlier world-record paella made on 8 March 1992 which fed about 100,000 people. Galbis’s record-breaking 1992 paella is listed in Guinness World Records. Wait for my Next Post for the recipe of Paella.